Have you noticed an increase of both diagnosed and un-diagnosed anxiety in your students over the last few years? I sure have! I'm starting year #23 of teaching and have concerns about how much anxiety I'm seeing in students these past few years. Each student's story is their own and particular to them, but I will say that I just can't help but think that increased testing and pace of life at school and home play a role. Anywhooo, I am making a deliberate and concerted effort to keep things calm and peaceful in my classroom and started the first days of school centered on four statements with my students. So, on the first day of school, amidst teaching a bunch of the most important procedures and routines (bathroom, cafeteria, where to locate important items in the classroom, etc), I spent much of our day around these core statements. It might be helpful for you to know that I had intentionally placed kids at tables with friends from their class last year - this was a huge help for many when they arrived for Meet & Greet the night before. Students that are new to our school were spread out across the tables and I made a point of introducing the new student to the kids at their table very early in the day. We started our first day with JUST the first statement "It's okay to not know," but had the students helped me compose it, Shared Writing style. I introduced myself, of course, and then talked about how I was both totally excited and nervous about starting the new school year. That starting a new school year makes me feel big feelings, that some of those feelings are almost opposites, like excited and afraid. That our feelings are our feelings and we have choices in how we handle them. Then I shared the statement and asked for their help in writing it on the whiteboard easel. I picked the statement, but they eagerly helped me remember to start with an upper case letter, put spaces between my words, spell sight words, and end with a period. I reminded them, "See - you already know a lot! There will be things about first grade that you know already and there will be things you don't know and no matter what, it's okay! It's okay to not know." Then we practiced taking some deep breaths, because sometimes when a person doesn't know something, they forget to breathe and they don't even realize it. Breathing is always important, especially so when we are worried and stressed. So we practiced some more breathing. Then, we carried about the day, learning about where important items like tissue, pencils, recycling/garbage baskets, band aids and such are kept. I answered some questions from the students about those kinds of things. Then we started the launch into the next statement, "We are kind," by first reading, Chrysanthemum. receiving a little bit of compensation for orders made from links I provide. We will use this book as a touchstone book for retelling, kindness, vocabulary, character change, dramatizing characters, etc, throughout the school year, but for this first reading we focused on kindness and how when someone says or does unkind things, it hurts feelings. Then, again, Shared Writing style, the students helped me remember to start with an upper case letter, put spaces between words, spell sight words, and end with a period. This time, I added (but ultimately erased) a segment on how we don't say, "How do you spell?" in first grade. See the blue underlines under "It is okay?" in the first statement? I went back to that and reminded them that the English language is tricky and sassy and even kinda naughty so when we spell words we don't know, we spell them one part at a time. 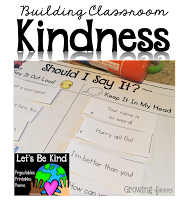 By the way, this important work also helps lay a foundation for my "Let's Be Kind" mini-unit of projectables, printables and original poems. After that segment of the morning, we learned about and practiced the recess and cafeteria routines and procedures, followed by heading out to recess. It was the calmest I have ever felt on day one of school. 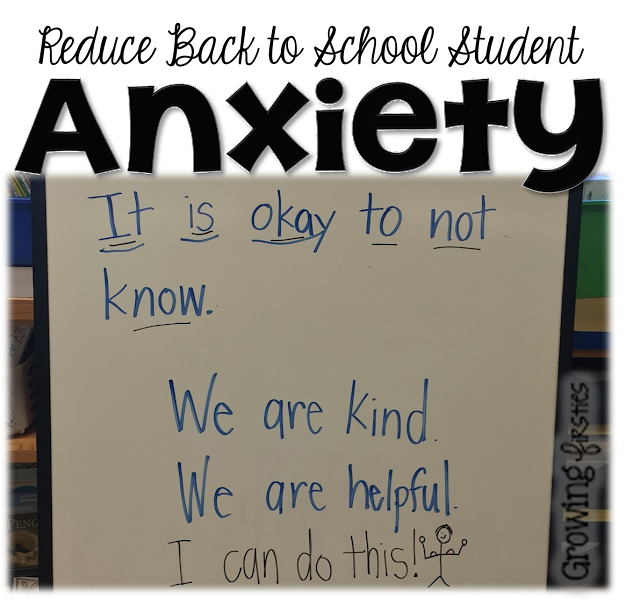 Since our school has a new routine from last year to go from recess to lunch, we had stuff to sink our teeth into about what felt confusing and made them worry. So after lunch I took questions and we discussed how to handle those situations. Which led to core statement #3..."We are helpful." Which I wrote again, Shared Writing style. As you know, kids are different. Some take things in stride more easily than others. Some listen very closely and can handle changes without a problem. Some feel worried and internalize it without seeking help, then get stuck and frustrated and break down or shut down. So, we talked about how it's kind to be helpful to others. Specifically to our recess/lunch routine, when you know what to do, you can look for others who look worried and confused and offer your help. You might say something like, "What can I do to help you?" or "Let me show you where to go." Then we brainstormed ways we can be helpful around our classroom. Locating items, remembering the direction about what to work on when we're done, pushing chairs in, noticing when someone looks like they need help, following the steps of our morning routine, etc. Now that there were three statements, we read and reread them Shared Reading style. Then we practiced our line up procedures again and headed to Music class. Upon returning, we added Core Statement #4. Our discussion about this tied the previous three statements together and also is super important in our efforts to be kind to ourselves. Whenever we have that worried feeling, we want to switch to "Power Mode" and tell ourselves, "I can do this!" We practiced saying it in strong, confident voices because when we feel confident we sound confident, hence the somewhat lame stick figure drawing with muscles. My goal is to help all kids know that problems are normal and part of every day life, throughout your life. That just because you encounter a problem, you aren't "bad" or "dumb" or anything of that kind. When you know and expect that problems will occur, you have a better mindset and attitude about handling them. A better mindset...a Growth Mindset. You might like these three posts, which include freebies and read aloud suggestions. Click any image to get to that particular post. Then we worked on our first day time capsule with the opportunity to practice that confident, "I can do this!" attitude while I circulated, complimenting them for their efforts and nudging them to spell part by part but not get too caught up in perfect spelling. After recess and popsicles, we re-read our chart in animated voices. I took questions and told them what to expect when they arrive at school tomorrow, gave them their Take Home Folders (which I'd pre-filled, rather than attempt to have them go through the mailbox routine.) and we headed out to lockers and end of day spots in the hallway. So - that's it - that's how my day went. Was I exhausted? Yep. But not so much as previous years. So, do I have data to show that this helped reduce anxiety in my students. I do have data of the qualitative, not quantitative, kind. 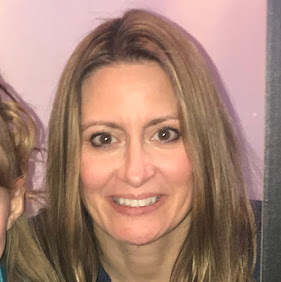 Multiple parents of my students with diagnosed anxiety emailed me to say thank you for such a calm start to the year....that their child(ren) had been very nervous and full of tears about going to school the first day, yet felt great about going back the next day, saying, "I can do this! It's okay to not know stuff." Now THAT is data I can carry in my heart. 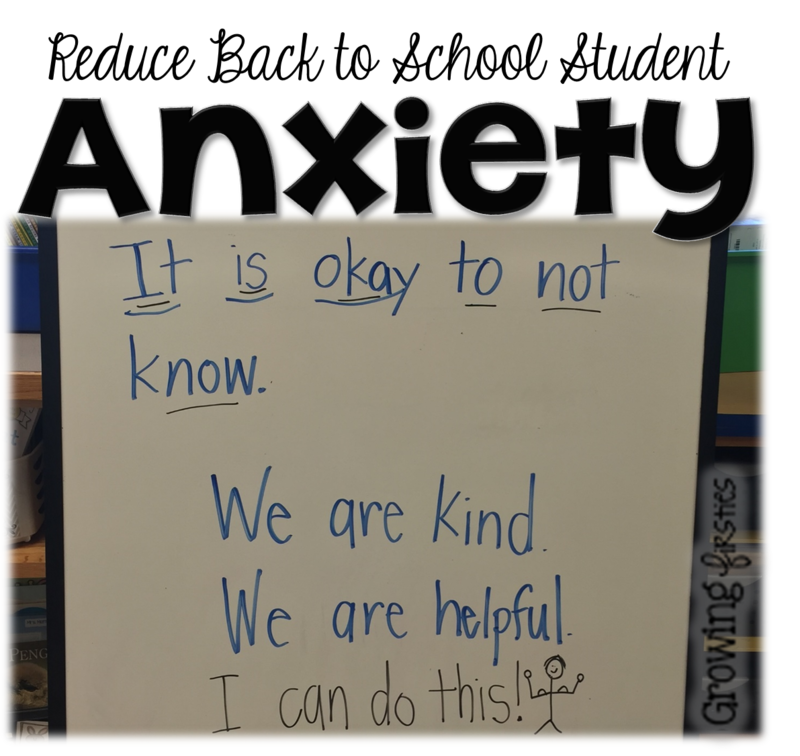 Readers, you are FULL of awesomeness and I would love to hear what YOU do to help reduce your students' anxiety in the comments. Thank you for sharing this with us. What a great start to the school year! 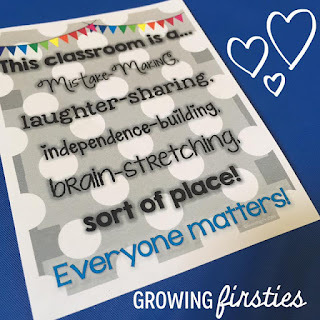 I love the idea of Chrysanthemum as an anchor for first grade, too. Thanks so much for this post - although a bit later in September for me - I NEEDED to hear that and today is as good a day as any! Your words of wisdom are already making a difference for me! And hopefully my students too! "It's okay to not know!" Now, on to deep breathing!